asphalt vs. infrared repair without seam. enter and a far more permanent repair. 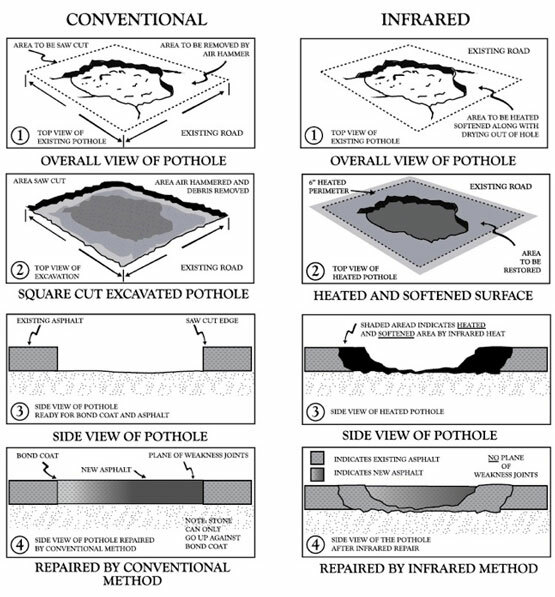 Repairing asphalt by conventional methods is a very expensive and time-consuming process. It requires a significant amount of equipment, material and manpower, and the results are from from permanent. Even when done correctly, the finished conventional asphalt repair is left with a cold seam where the hot asphalt meets the existing pavement. this cold seam is the weak link and is where water will eventually re-enter the repair and cause it to fail. The price of asphalt has been increasing over the years. Using infrared heat technology will allow you to repair pot holes, bird-baths, utility cuts, rough surfaces and more at an affordable rate by recycling the existing asphalt. Infrared repair techniques are faster than cutting out and replacing asphalt. A thermal bond is made with the existing asphalt verse leaving a seam around the perimeter of a repair where water can eventually leak in. Traffic can resume about ½ hour after infrared process has been completed. One of the best parts about Infrared Restoration is it can be done around the clock 365 days a year - no problems with cold or wet weather. Not only is it Cost Effective but it's Eco Friendly too! We reuse 95% of the existing asphalt and all of our equipment is contained on one truck. Whereas, the conventional method discards 100% of the existing asphalt and uses multiple carbon emitting trucks and machines. Welcome to Frank A. Macchione Construction's Infrared Paving Page, a non traditional venture from a family with a lot of tradition. After over 40 years in paving, we have decided to bring a new technology to the northeast. We invite you to learn more about seamless infrared asphalt patching, an environmentally friendly, long lasting, aesthetically pleasing technology.